Fourteen students have been inducted into Carnegie Mellon University’s chapter of the Phi Beta Kappa Society (PBK), including four from the Dietrich College of Humanities and Social Sciences. The early initiation ceremony included keynote presentations from Dietrich College alumnae Eleanor Haglund and Lucy Pei, who were both early initiates to PBK last year. Haglund, who earned a bachelor of arts degree in creative writing, received college and university honors and was a member of the Phi Kappa Phi, Sigma Tau Delta, Lambda Sigma, Mortar Board and Psi Chi honor societies in addition to PBK. As a Dietrich College Honors Fellow, she wrote her first novel. Haglund is currently a business and regulatory affairs analyst at a local pharmaceutical company. Pei received bachelor’s degrees in global studies and human-computer interaction (HCI). She was awarded the Eugene D. Levy Award for Most Outstanding Graduate, Department of History, and is an Andrew Carnegie Society Scholar. As an honors fellow she completed a thesis exploring the experiences of English language learners and their teachers, using the Pittsburgh Public Schools as a case study. She also completed an HCI capstone project that involved designing an online course about collaboration, which is currently used at CMU. Pei currently works as an instructional design consultant at TiER1 Performance Solutions in Pittsburgh. According to Joseph E. Devine, Haglund and Pei exemplify PBK’s ideals by continuing to nurture a love of learning alongside their busy professional lives. 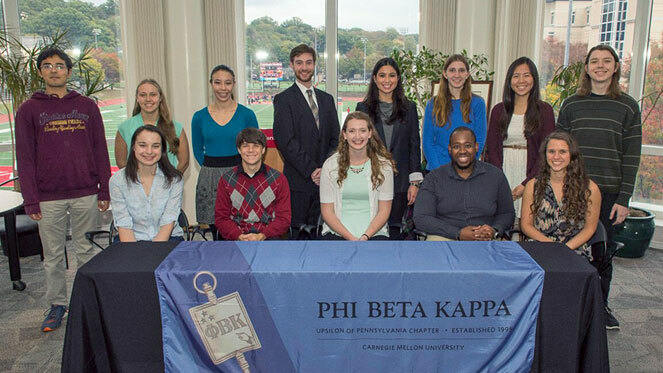 “The Phi Beta Kappa name— formed from the initials of the Greek motto Philosophia Biou Kybernetes— translates to ‘Love of wisdom, the guide of life.’ The students who have been inducted—including our keynote speakers—have shown their commitment to this philosophy through academic excellence, honesty and tolerance,” said Devine, associate dean for undergraduate studies in the Dietrich College and the chapter’s secretary and treasurer. Only about 10 percent of college students nationwide receive an invitation to join the prestigious honor society, which has chapters at 286 institutions of higher education nationwide. View photos from the early initiation ceremony.